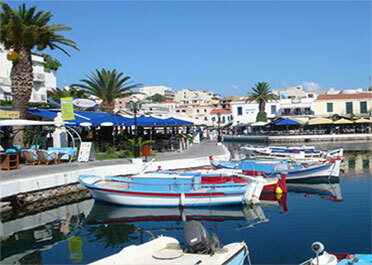 The name Agios Nikolaos means Saint Nicholas who is the patron saint of sailors and of all of Greece. Agios, as it is referred to by all the islanders, retains a traditional, quaint and tranquil fishing town lifestyle which hasn't lost its charm with its busy tourist infrastructure. The small, especially well attended port of Agios Nikolaos, has its own charm, as it is surrounded by the picturesque tile-roofed houses and it is illuminated in the evenings by the lights of the shops and those of the "kaikis", fishing boats moored at the big dock. This is their starting point of their day trips to Spinalonga, Elounda and the picturesque Mirabello Bay.